Rabbi Moshe Azman of Chabad is worried that some of the country's recent violence will turn against the Jews. Hundreds of thousands of people rallied at Kiev's Independence Square Sunday, defying a ban imposed a day earlier. Estimates of the numbers ranged from around 100,000 to more than 350,000, according to the BBC. 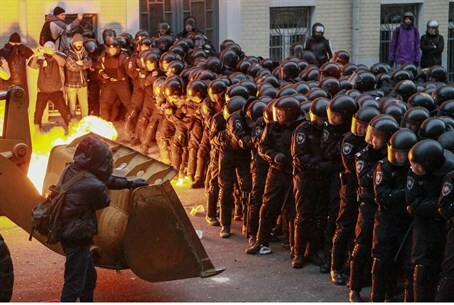 Protesters are demanding the resignation of President Viktor Yanukovych's government and new elections. The masses are protesting Yanukovych's decision not to sign a deal for joining the European Union. Jailed former prime minister Yulia Timoshenko has been on hunger strike since Monday, demanding that the country join the EU. In a special interview with Arutz Sheva, Kiev Chabad's Rabbi Moshe Azman said some of the planned Hanukkah events were canceled because of the dangerous situation. "The atmosphere in the streets is tense and the feeling is that this is not a demonstration but a revolution,” Rabbi Azman said. The large number of demonstrators and the violence used by police against them contribute to this assessment, he explained. The rabbi said that there are “provocations on both sides” and that according to rumors, the Ukrainian government plans to bring military reinforcements to the city and these may surround it. “There is no curfew yet,” he said. The rabbi explained that the main concern is that "groups of hooligans" will use the situation as a pretext to lash out at easy targets. “We know from the past that the first ones to be hit are the Jews,” he added. One of the three parties that seeks to bring down the government is anti-Semitic, he added.